In 2010 the first crowdfunding platforms for creative projects launched in Germany. By providing reward based crowdfunding those platforms created new opportunities for filmmakers, writers, designers, musicians and other protagonists in the creative industries to finance their ideas. Since then a lot of projects have been funded successfully and the crowdfunding market showed steady growth. Although most of the platforms are doing a great job, there’s still room for improvement. To establish crowdfundig as an important financing and marketing tool for the long term, there need to be more successfull projects. Not only in terms of reaching a set funding goal, but also in terms of building a sustainable and economically independent project or company. 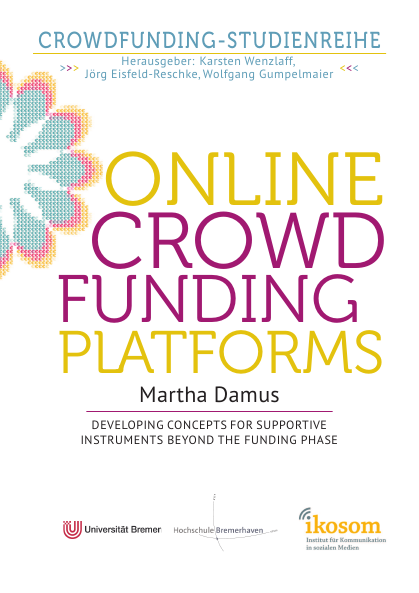 In her master’s thesis, Martha Damus gives valueable feedback on how crowdfunding platforms can support projects beyond the funding phase by implementing additional features on their websites. By classifying crowdfunding platforms as creativity support tools, she discusses their importance on a higher level and makes some great suggestions for strengthen one of the basic prerequisite of any crowdfunding-campaign: building trust. Building trust, not only in the project owners, but also in the platforms. In that context, her work is not only a great overview of the concept of crowdfunding, but also a fundamental altercation with some really smart ideas to establish the general use of crowdfunding for the long term. .
Martha Damus studierte Kunst und Kommunikationswissenschaft in Greifswald und Digitale Medien in Bremen. Derzeit macht sie künstlerische Animationsfilme, gestaltet Webseiten, E-Learning-Einheiten und andere digitale Produkte und betreibt zusammen mit ihrem Freund Marcus Oesterreich das black egg (black-egg.de, facebook.com/blackeggKunst), ein zum mobilen Kunstraum umgebauter Wohnwagen, der nun von Ort zu Ort reist und junge, v.a. digitale Kunst präsentiert. Das Thema Crowdfunding beschäftigt sie seit einiger Zeit – aus der Perspektive der Kulturschaffenden, die selbst nach Vernetzungs- und Finanzierungsmöglichkeiten sucht, sowie aus der Perspektive der Digitale-Medien-Spezialistin, die sich für neue Phänomene interessiert.